Thoughts on Service. A Student's Story. 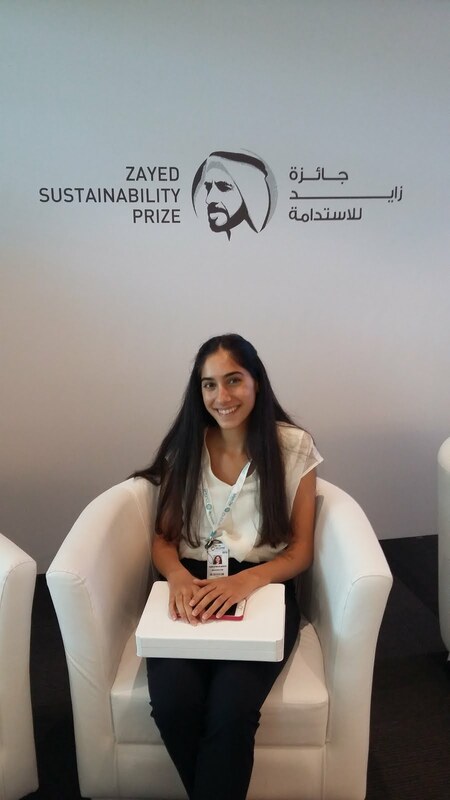 The following post was written by one of our students who, in conjunction with her work as a SHINE student leader, shares her experience in this short post. Her engagement at Al Noor Learning Centre, just down the street from ASD, is one of several opportunities for our students to engage directly with our community partners. "Going to Al Noor has become something I like to do when I have free days from school. 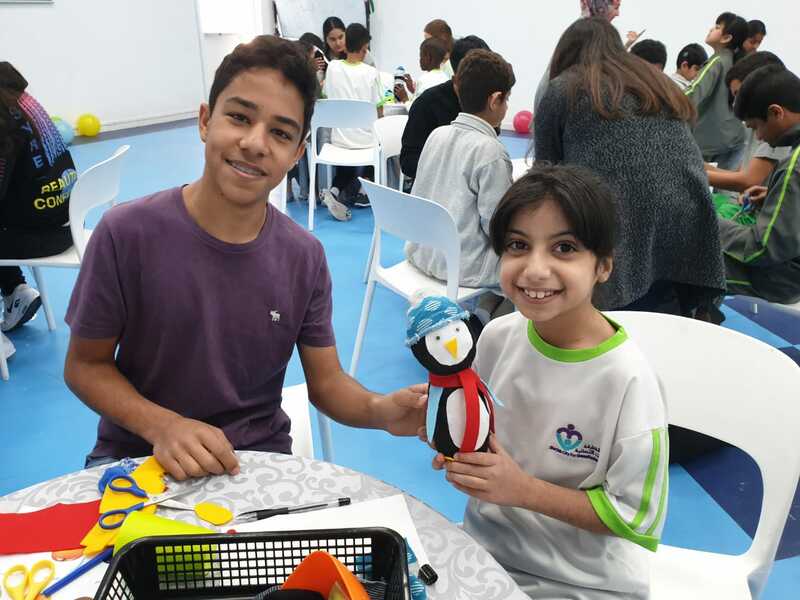 Now we have implemented a volunteer program in Club SHINE at ASD to allow students to volunteer at Al Noor during school days! Help is always appreciated at the school and I really enjoy spending time with the students. Sometimes during lunch, we’ll play the students’ favorite songs and enjoy the music while they eat. In PE and Music classes the volunteers get to play along, acting as an example for the students to follow. Ever since I was in tenth grade, Al Noor has been open to my volunteer service. The school is an amazing place to collaborate with kids and offer service to teachers. There are no restrictions to your service during the day which is why going during the school day is so manageable. 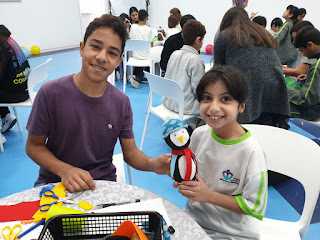 I’m grateful to ASD for creating the opportunity to connect with Al Noor in a way we have never done in the past. It’s an incredible experience and I recommend it to all students who love giving their time to those in need." It's an annual event, run entirely by students for the entire school community. Some say it's the best event of the year, nestled between the ES library and the ES building in a beautiful evening gathering. Open, mellow, friendly, with beanbags scattered and a backdrop of bleachers in a semi-circular setting. Quite lovely really. But as welcoming and open as the event is the best part of it is the reason behind its being. Years ago it was introduced by the Global Issues Network in the high school. It was named Songs for Syria at the time, with proceeds going to an organization supporting education of Syrian refugee children. Over time, and with changing fundraising laws, the event was rechristened Harmonies for Hope, becoming less a fundraiser and more of an avenue for increasing awareness in our community. This year's event - organized entirely by students - was a collaboration between the Global Issues Network and SHINE, a student organization that engages with the Al Noor Learning Center just down the road in Al Barsha. The idea behind it is to introduce our community to Al Noor and to celebrate the diverse members of our extended community. The video below is shared on the ASD Youtube Channel. It shows the entirety of the show and is an example of the wonderful work of our students in successful event management and celebration of the humanity in all of us! New Beginnings: Community Engagement for a New SO. HS student organizations (SO) provide the kind of opportunities that students often look for to broaden their educational experience. Through a program that is structured in terms of organization yet flexible in terms of support student initiative, passion and voice, the HS student organizations have a life of their own. Students are able to create, set up and develop their own organizations with an link to the Sustainable Development Goals. This year alone with have eight new pilot organizations (which is what we call year 1 groups who are getting themselves organized). Pilot organizations essentially have up to one year to establish a leadership team, determine a formal mission, create a constitution, establish goals and, in the case of service organizations, support a local partner organization. New Beginning is such a group. Their application was made, as they often are, at the end of last academic year, though an online form. Meeting with Service Learning Coordinator and subsequent ongoing support through their advisor had them "up and running" pretty early on. Then came the part that is often the most difficult... finding the community parter. In this case we partnered up with a local social enterprise named The Mawada Project to link us to communities we would not otherwise have exposure to. 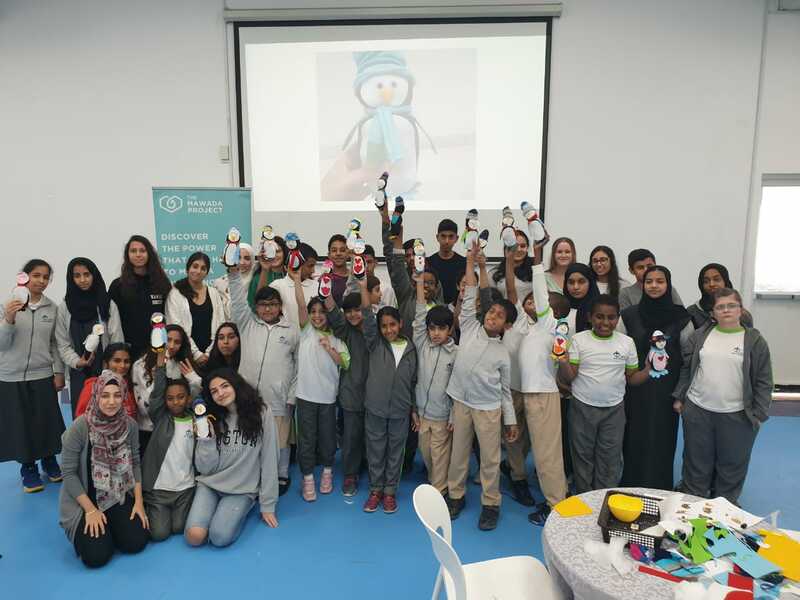 And on February 24 our students had the chance to meet a group of students from the Al Amal School for Deaf Children. Among their first "to do" items, of course, was to be introduced to sign language, to join in mutually beneficial activities and to just have fun. The Mawada Project has also shared a short video on their Twitter account. To take a look click here! "Deaf people are just normal people with a communication barrier. It's up to us to break that barrier each time." "We share more similarities than differences." Now that's some critical consciousness to build on! We look forward to more engagement opportunities as the year progresses! The ZSP Journey. Actually Just Beginning. By now it's been in the news, online, shared in social media and made the rounds of the word of mouth. 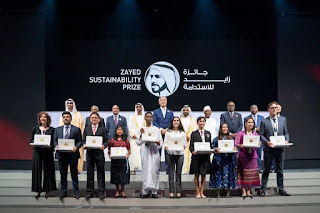 It would seem reasonable that we take a moment to formally state the level of pride in being awarded the Zayed Sustainability Prize as a representative of our host country! When we were invited to the awards event it was our perception that the awards ceremony itself would be the highlight, not recognizing that we would be the recipient of the award. When the awards were announced it became apparent that this would be a longer - albeit more exciting - journey! Our representative students - Yasmin Gulamhusein (member of Eco-Schools executive team and student leader of SEENAH) and Aleena Abbassi (Sustainability Action Team and Eco-schools executive team) - received the award and were nearly immediately thrust into events such as "winners lunch" and "gala dinner" where we got to mingle with many representatives of nations (e.g. presidents and ambassadors as well as many involved in the field of sustainability). Suddenly the girls were being asked to work on their confidence as they faced the press, their intonation and deliver as they were recorded for future media use. It was intense for a typical high school student but they dealt with it positively and learned along the way. In time, they've become more confident in how they deal with others and in defining their purpose in our community. 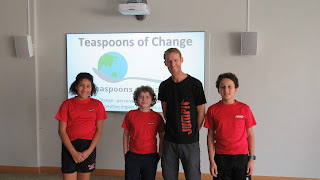 They are becoming great spokespeople for the sustainability of our community and the planet! The intensity has now subsided and we are already moving forward with our plans. The beehive has been introduced to our community and we are currently having conversations with potential sustainability monitoring companies as well as potential suppliers for our industrial composter. We've included students in the process where we can (one grade 9 Global Issues in Action student, actually, is working our facilities staff in gathering baseline data regarding food waste in our cafeteria) and expect the student-adult conversations to become commonplace as we move forward. What's in store for us moving forward? An ongoing opportunity to collaborate with the Zayed Sustainability Prize team in establishing the behind-the-scenes platforms that are necessary for the plans to become reality! We are thrilled that many of these plans are student-centered and many of the decisions will be made jointly, as they should. 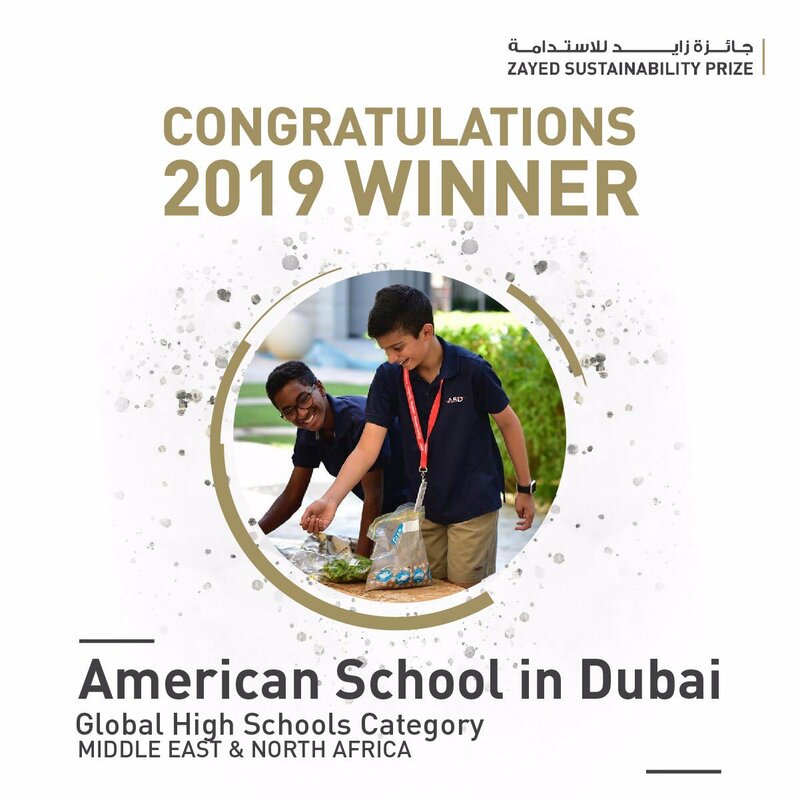 In the end this prize is a wonderful opportunity for our students to play a large role in the impact of sustainable behaviors and learning! What do Sustain Our World, a Grade 2 pollinators service learning experience, the Sustainability Action Team, our Facilities Department, the MS and HS Global Issues Network, our Sustainable Garden (and the classes that visit), Eco-Schools, our Learning Kitchen and the Sustainability Committee have in common? 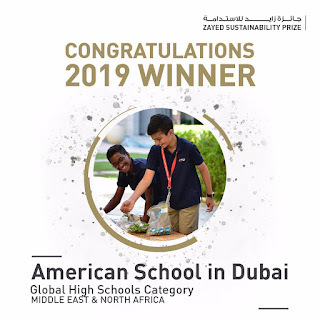 Well, they all form part of the fabric of sustainability at ASD which was the foundation for our application for the Zayed Sustainability Prize. What at that point seemed like a distant dream has now become a reality and we are now faced with the task of following through on what we have planned. But the best way to say it is through the voices of our students who were highlighted in the official Zayed Sustainability Prize (#zayedsustainabilityprize) winner's video that was shared last week on Youtube. 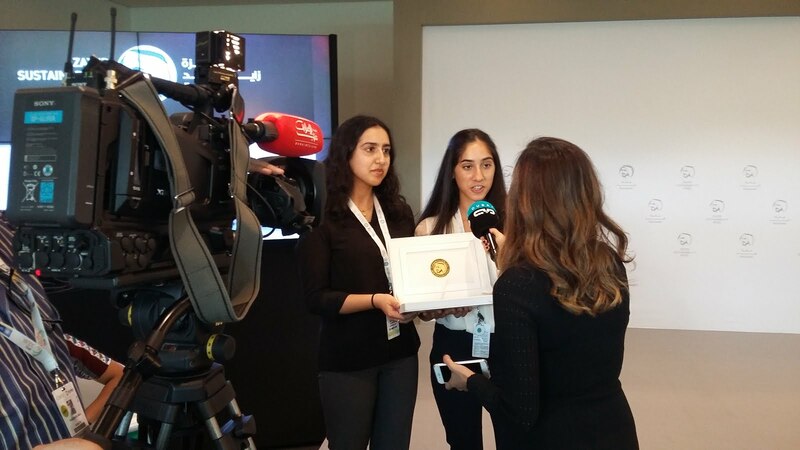 It's a wonderful created overview of what our plans are, how we piece them all together and how the legacy of Sheik Zayed lives on through this prize. Take a look! 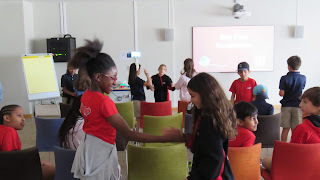 Last week's blog talked about that JUMP Foundation was able to talk SDGs with our Grade 5 students, but the bigger reason why they were in town was to facilitate an ASD visioning process for our community with regard to the "why" behind the establishment of a our soon-to-be-established ASD/JUMP Global Citizenship Center. Several JUMP facilitators have been on campus in the past two weeks to run a number of focus group sessions with our PTSA executive committee members, the HS Service Learning Innovation Team (faculty & administration), the Learning Leadership Team (administrative), the ES Roots & Shoots club members, a HS Leadership Flex as well as a more open session with invited student organization leaders. The data collected was aimed to provide guidance for planning and facilitation of a full-day visioning session to guide the JUMP Global Citizenship Center. And what can we look forward to? 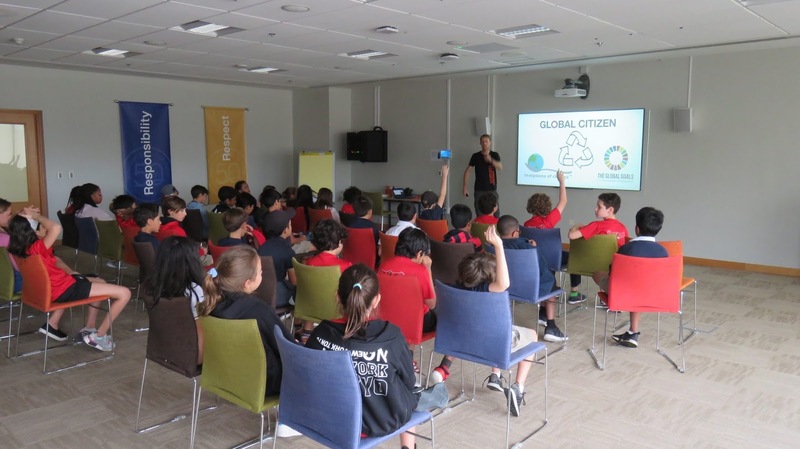 A Global Citizenship Week is slated for later in the year when JUMP facilitators will be engaging more deeply with faculty, students and the wider community in deepening our understanding of global citizenship, increasing our collective capacity in addressing global issues and leadership skill building. Look out for more information soon! d'Arcy Lunn is a global nomad of sorts, a strange type of fellow that takes all this global citizenship talk to heart. He bikes across continents. He refuses to be given a ride from the airport, opting instead to take public transit. He refuses water bottles (he hasn't used one in six years!). 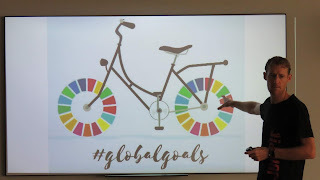 He works to develop learning activities to support the Sustainable Development Goals through the Worlds Largest Lesson. He supports the infusion of global citizenship education into the curricula and experiences of many schools around the world. He studies peace. And he is, as of quite recently, the new Director for Global Citizenship Education for the JUMP! Foundation, with whom ASD is about to embark on a multi-year collaboration through the jointly operated ASD/JUMP Global Citizenship Center. 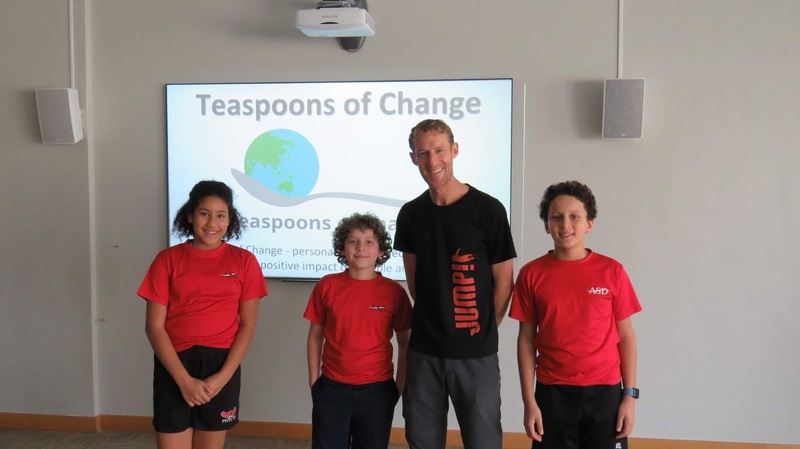 But for this one session with grade 5 today d'Arcy was a walking, talking example of a global citizen promoting personal action that, over time, makes big impact on the community and the world at large. 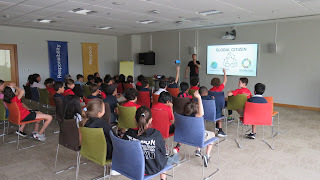 The grade 5 students were given the opportunity to discuss what global citizenship is, what it looks like and how they, as 10-11 year old global citizens, might decide to make personal and/or collective change. Ideas shared ranged from refusing plastic bags to eating free trade chocolate to reducing shower times. 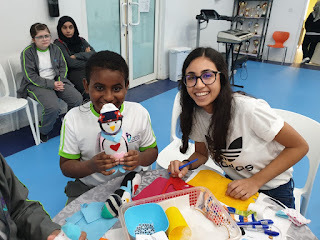 The experience supports the grade 5 curriculum focusing on global issues and one we, as a school, are looking to expand upon in regard to global citizenship education. A little ethical choice-making, a little critical consciousness, a little informed action and global citizenship education is very much in line with our present service learning aspirations. We are hopeful that what began with grade 5 today will continue to grow into the future. Thank you d'Arcy!